My husband and the kidlings named her "Mary Grayson" (due in large part, I think, to her gray covering). She's almost like a member of the family. I catch the kidlings hugging her all the time. Mary is currently dressed in a kimono I got at a sale my friend, Emiko, had last week. Emiko just got back from Japan, bringing a suitcase full of lovely kimono pieces with her. This was one of the intact kimonos she had that she assumed would be taken apart and made into something else. The kimono is so beautiful, though, I can't bear to cut it up so now Mary has a new outfit. 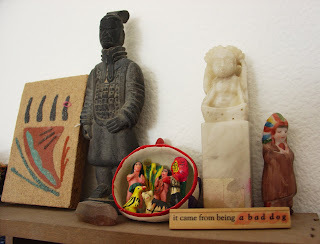 The white buddha is a chop with my chinese name, the sandpainting is from a trip to New Mexico I took with my best pal Lori and the "bad dog" pin is a gift my husband bought from The Cambridge Artists Cooperative. I got the Terracotta Warrior on a trip to Xian and the little native american was a gift from my mom. The origins of everything else are lost in the sands of time. Love these photos and this post! I know what you mean about not wanting to cut up that kimono, it's gorgeous (my fave colors no less)! Kimono fabric is a really nice gift from your friend. I joined the Flickr studio group, thanks for the tip, can't wait to see all the photos and add my own! I love seeing your studio photos. I've been wanting to join that group - in September, I'm sure!